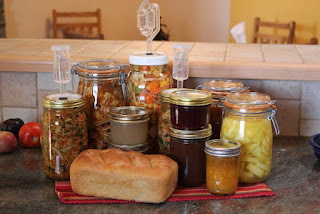 My "Other" Art Form: Fermentation! we still had a few bruised apples to harvest and process in some fashion. The photo on the top is a sampling of all I/we got done this past week. The rest is in the pantry. When the fermentation is complete, in a few days, all the ferments will be stored in the extra 'frig. They'll look just like they do now: fresh-picked and colorful and chock-full of enhanced nutrients and pro-biotics. And Delicious! From left to right in the back row: Fermented Kim Chi, fermented Fruit Kim Chi, Vegeroncini, fermented apple sauce and fermented pineapple (the rest went into the Fruit Kim Chi). The next row is Apple Jelly, Apple Butter, and made earlier in the season, Blackberry and Peach Jam. In front is a loaf of long-rise San Francisco Sour Dough bread made from Einkorn flour. The bottom picture is a 1/2 liter of beautiful, golden Ghee made from 2 lbs of Kerry Gold Butter! Why ferment? It's an ancient way of preserving just about anything and everything. Our ancestors didn't have our "modern" methods of preserving foods, so they dried, salted and fermented whatever wouldn't keep more than a day or so. And especially during harvest times, whether it be grains, fruits, vegetables or meat of just about any kind. Fermentation not only preserves enzymes, it enhances the nutrient value, too. It's actually even better for you than eating the product fresh. Not to mention the friendly bacteria that cause the fermentation in the first place enhance and aid digestion, and colonize our guts with ba-zillions of life-giving little critters that virtually effect every function in our body. Especially our immune system. Some docs say, "your immune system begins in your gut". 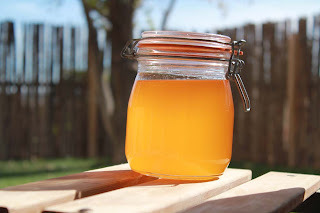 We try and eat a fermented product with every meal, and sometimes we eat entire meals composed of fermented foods, like a "peasant lunch" of lactic-acid fermented sausage, cheese, a pickle, some sourdough bread and a refreshing glass of kombucha, (which is fermented tea). Here's a list of the fermented foods we eat or drink on a daily basis. Most of them we make ourselves. I'll bet you're eating some and didn't even know it! Coffee, dried black tea, chocolate, wine, kombucha, kefir and water kefir, yogurt, sourdough bread, greek yogurt/sourcream, dill pickles, pickled beets, jalapenos, kim chi, sourkraut, fruit kim chi, fermented peaches, blackberries, pineapple, applesauce, vegeroncini, lactic-acid summer sausage, cheddar cheese. I'm sure I've left out something, but you get the idea. The coffee, dried tea and chocolate no longer contain active bacteria, but they are produced by a fermentation process, nonetheless. Beer is, too, but now it is pasteurized and no longer as good for you as in times past. Same with wine. I'll write another blog about my process for making my Einkorn Sourdough another time, along with the beautiful and delicious butter Ghee. My mouth is watering for some right now! I've been wanting to figure out a way to incorporate my vast quantities of hand-dyed fabrics, from my fiber-artist, art-quilt days, into my new work in oils. First, I tried painting a couple of small pieces on nice, decorative paper, glued to a board and covered in acrylic medium. That was pretty successful; I've got a picture in the files somewhere of Indigo Pete on an orange printed paper background. Looked pretty neat. And the technique seemed sound. Ken shot the photos of Hunter last summer, I think, out in the garden. The background was all washed out, looked almost white in the photo, but the images of Hunter were good. I've been hanging on to them, waiting for the right opportunity to figure out what I wanted to do with them. Thought they'd made a good "pair". 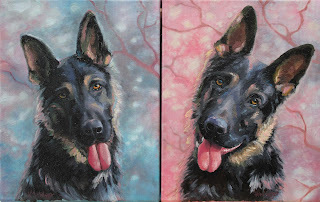 And I had two 10 x 8 gallery wrapped canvases I bought on sale. So, I rummaged around in my fabric boxes until I found just the right piece of silk to serve as background. Spent most of a Sunday afternoon "gluing" it down to the canvasses with acrylic medium. Silk stretches when its wet, so had to keep working it over the canvas to keep it tight, and miter the edges around and onto the back of the gallery wrap. When I was satisfied, I let them dry then coated them with 3-4 more coats of medium. That gives them sort of a waxy appearance, and a good ground for the oils. Pretty flat and slick without much texture except the brush strokes from the medium. I drew the images first, scaling both the photo and my drawing to sight-size, in fourths, with diagonal lines for the eyes and head tilt. Then I transferred the outlines of the drawing to the silk ground and painted them, using the "posterized" photos as my guide. Each one took a whole day. I got the image on the left a little bigger than the image on the right, but I think they turned out pretty cool. What do you think? Something I should pursue? I sure have lots of hand-dyed fabric stashed away!